Web Design Solutions This is the link to Dana's web development Business, Web Design Solutions. The Woolley Family Website My closest college friend (and former roommate) has a website which she keeps updated with stories about the days of her daughter, Norah, growing up. The Foy Family Website My good college friend (and former roommate) has a family blog where she keeps everyone in the loop on what is going on. 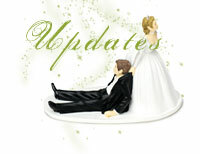 There are updates on her, her husband, Mike, and their newest addition to the family, their baby daughter, Brenna Linn. The Cochran Family Website My cousin, Ashley's family website. I always check it to get updates on her, her husband Dusty, and her children Max and Rory. Bcat Threads This is Brooke's on-line boutique. She is a fashion designer who sells her designs on-line. She is a supporter of other up-and-coming San Diego fashion designers and gives them the opportunity to sell their designs on her website as well.